We are located at Indooroopilly, Toombul, Hamilton and Bribie Island for your convenience. Our team of 10 podiatrists have shared experience of over 120 years. With 280 hours of extra training each year and over 550,000 feet treated, if you’ve got it, our Brisbane based Podiatrists have seen it and fixed it before! Walk Without Pain are pleased to offer gap free orthotics at each four of our Podiatry Centres. Types of Gap Free Orthotics available. On average, it takes about a week for the orthotics to be ready. Different sorts of orthotics have different lifespans and are used for different purposes. The information below about types of devices has more information on orthotic styles. However, this is mostly a clinical decision that should by guided by your podiatrist. The correct choice for you is determined largely by your age, foot type and symptoms but influenced by your preferences and style of footwear. The gap free orthotics are not different to our regular orthotic offerings, meaning you are not disadvantaged by this choice. Each of our clinics has HICAPS claiming on site, so only the out of pocket component (if any) is payable by you. Financial details of the offer for Gap Free Orthotics. How does payment for gap free orthotics work? The threshold of required payment is $400.This means if your private health insurance rebates you less than $400, you only pay the difference, of up to $400! How much? The allowance for orthotics with most private health funds is between $400 – $500. We recommend checking your coverage to see how much your private health fund covers. Make the most of your private health insurance by calling us on 3256 1006 today! The offer requires that you pay any shortfall of our minimum acceptable fee of $400 per pair or orthotics. The presence or absence of a shortfall can usually be determined at the initial consultation by swiping the health insurance card through our HICAPS terminal. This information can also be found by calling your insurer directly. You MUST inform us of your intention to claim this offer at the time of placing the orthotic order. If you have read this page after your orthotic has been ordered, it cannot be claimed retrospectively. The model of your foot contour is made by scanning electronically to create an accurate 3D model of each foot. The biomechanical imperfections can be corrected using this digital model. This then gives us a perfect ‘virtual foot’ that is aligned how your foot should be. The benefits of these plastic shell orthotics are that they are only 3 mm thick. This, along with their light weight, means they can be accomodated in a multitude of sandals and shoes for men, women and children. They can have varying amount of flex built in for comfort and can be covered or naked depending on the use for which they are intended. Most orthotics referred to as ‘soft’ orthotics are made of a closed cell rubber called EVA. These have some desirable features, especially when used for sports. As they are a bulkier option, soft orthotics are often not suitable for feminine shoes as they can limit your choice of footwear quite markedly. We can also supply our patented (pending) Copythotic orthotic devices under our Gap Free Orthotic offer. This relies on reinterpreting an existing orthotic device to create a totally new orthotic. A Copythotic™ is made from a range of orthotic materials and in combining these, can be made anywhere on the firmness continuum. It is generally eligible for our Gap Free orthotics offer. A Copythotic can be made to any thickness required, down to 1.5 mm thick. Any orthotic can be reinterpreted to fit into 95% of shoe possibilities. In some cases, a very, very small orthotic may no longer fulfil enough of its original function be worthwhile. Therefore, an individual assessment is necessary. We have found that around 60% of our customers choose to use Copythotics because their previous devices do not fit into their existing or desired footwear. Most of the information we need about your feet has already been captured in your existing orthotic device. We can work with orthotics that were made by other practitioners. We can also modify the orthotic to a moderate degree to correct errors in the original device. Another other benefit is that Copythotics can be made very small and as hard or soft as we please. We have found that around 40% of our customers elect to get Copythotics because their previous devices have been uncomfortably hard. The original orthotics are returned unharmed. A Copythotic™is an exact copy of an existing device. This means that you will need to have an existing insert that can be supplied to our podiatrists. You can learn more about Copythotics here! 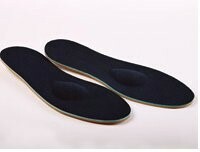 “Lesser” orthotic options includes our custom made padded insoles. Our podiatry clinics still make traditional “old-school” padded insoles in-house. These can be a very useful option for addressing pressure areas, relieving corns and treating milder mechanical complaints. An additional benefit is that these insoles are relatively inexpensive and would not absorb a significant amount of your orthotic allowance from your private health fund. The following codes take their benefits from the ‘podiatry treatment’ pool of money. Most funds have podiatry as a separate pool. However some funds might have a combined total with other sorts of allied health providers. The following items often come from the pool of money for ‘appliances’ . This included walking sticks, hearing aids and wigs for chemotherapy, amongst other things. Some exclusions will apply for very costly items (for example carbon fibre plates). This is also true for high labour-intensive work which could be required in severe conditions. This will be able to be determined at your initial appointment. In many cases, the examination of your condition and the making of the foot model can be done at the initial consultation. We can then move on to making the devices ready for collection in one week. Sometimes, there may be a need to delay the ordering of the orthotics until the follow up visit. For example, if more information is required by way of an x-ray, ultrasound or trial of a type of treatment. In this case, standard fees will be payable for the consultation claimable from your health insurance. BUPA Orthotics: Walk Without Pain is a BUPA Members First podiatry provider. This means that we have been accepted by BUPA as a reliable practice. Also, BUPA is happy to refer their customers to see our team. There are two particular benefits of using a BUPA preferred podiatrist. You get both a lower cost of visit (by around 10 %) and a higher rebate compared to other providers. MBP Orthotics / Medibank Private Orthotics: Walk Without Pain is a MBP Preferred for podiatry. This means that Medibank Private have accepted us as a reliable practice. MBP is happy to refer their customers to see our team. There are two particular benefits of using a MBP preferred podiatrist. You get both a lower cost of visit (by around 10 %). and a higher rebate compared to other providers (again by around 10%). HCF Orthotics and all other health funds. In Australia, podiatrists aren’t required to be registered with each health fund individually. This is co-ordinated through AHPRA and the HICAPS software. All of our podiatrist are therefore able to treat members of any health fund for our Gap Free orthotics service.